Solid Black Wood Canvas Floater Frame. Minimum order of 5 required. 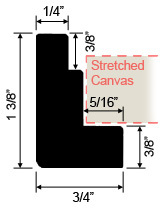 To determine the appropriate frame size, simply use the exact outside measurements of your canvas. For example, a 5x7 Floater Frame will frame a 5x7 Canvas. The frame shell ships assembled and with the following hardware: 2 D-rings and a wire.